New Customers - Switch to TaxAct, File Your Federal and State Return for Just $5 Each! 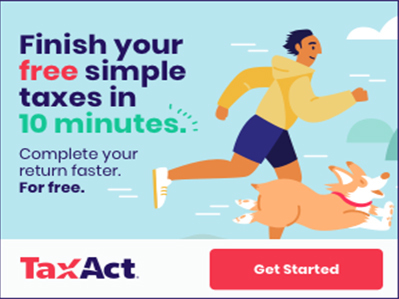 Switch to TaxAct, File Your Federal and State Return for Just $5 Each! New customers only. Free Simple Federal Returns, Max Refund Guarantee, and $100K Accuracy Guarantee with TaxAct! Start Now!